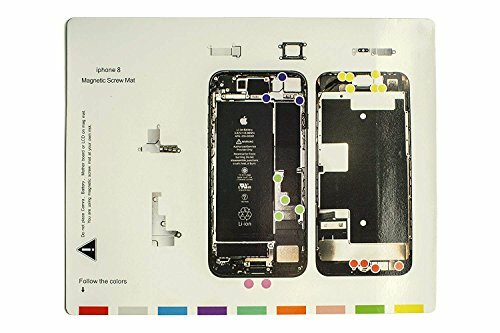 We all know that the length and thickness of the iphone internal screws are different, if the wrong location, screw the wrong screws are likely to top bad LCD and other components. Maintenance may make you worry, with this magnetic screw position memory pad will make your maintenance more smoothly, effectively avoid the risk of DIY. Let you fully enjoy the fun of DIY! Note that the machine itself has an individual screw material can not be magnetic adsorption. It allows you to easily manage a complicated repair without all the headache. 100% cell phone internal image on the mat for each model of cell phone . Professional cell phone repairing tool kit for iPhone 8/8 plus/X offers a great way to store and organize screws or other small metal objects. If you have any questions about this product by X-Sea, contact us by completing and submitting the form below. If you are looking for a specif part number, please include it with your message. Wireless Car Charger, 2 in 1 10W Fast Wireless Charger Air Vent & Bracket Phone Holder for iPhoneX/8/8 Plus, Samsung Galaxy S9/S9+/Note 8/S8/S8 Plus/S7/S6 Edge All Qi Enabled.